The days have been hot and humid since I have arrived for my six month stay in the center of the Sierra Nevada Goldfields. Hard work and luck are a lot of what you see here in California. About four months ago now, I arrived in California with my notebook to tell Baltimore what the hype and “rush” is all about. I made the journey down with a group of men led by a man named Henry Miller, who left only shortly after the word got out on December 5th, 1848 when President James Polk addressed Congress about the riches that could be found here (1). It all came about when John Sutter built his fort down in Sacramento and hired James Marshall to build a sawmill, where he found gold in early 1848, but vowed to keep it a secret (2). Ever since the word got out and was publicly announced, the trek to California has been a long journey for lots of men wanted to strike riches, whether from the East, or immigrants from around the world, especially Europe and China (but we don’t let the immigrants much around our space, because the Gold is America’s, not theirs) (3). The travel down to California was a long one, but with high risk comes high reward. Some travelled by foot or wagon to get to gold, but we took the slightly shorter voyage by sea. Those who I have met that traveled by wagon, told me the journey was a slow battle. One man named James Cornell, travelled by wagon, and joined our group after we saw his success. He left his wagon, mules, and oxen, after some of his other group members were fatally ill and he had nobody else. James tells me “the travel had a varied course. We travelled across the desert and the mountains with all of our gear, but were lucky not to hit the Sierra Mountains in the cold harsh winter.” One real advantage of having James a part of our team is that he has tons of gear from his journey. He packed a cooking stove, cups, plates, forks, knives and lots more cooking materials than we had. We had gone through almost everything we brought since our 150 mile trek by foot from the California coast, but James’ supplies filled in perfectly. He even has some leftover rice, sugar, and coffee from his 6 month journey and the blankets he has served as nice warmth during some of the cold nights (4). We came to California by sea. The two most popular sea routes are: 1. A 5-7 month, 17,000 mile trip around South America and Cape Horn or 2. by steamboat through Panama. We chose the latter, since the weather and living conditions were not as severe, and we hoped to make up for the expensive cost, by getting first pick on the gold since the trip was significantly shorter than the 5-7 month journey (5). We live in tents and cook almost all of our food over an open fire, and only occasionally use the stove that James brought. Most of our food consists of beans, rice, eggs, and potatoes. (6). In this area, you hear of multiple fires, but luckily we have escaped them multiple times. Everyone here wears hats and is covered in sweat and dirt. But in the winters, when rain and snow are heavy people go to town and are away from many of the mines. I am worried that sickness is to come, because of all the stories of scurvy around us, but it seems we have found a relatively safe spot, where we can continue to work together as a group and stay a strong team (7). To mine for gold when we first got here, we used pans and swirled the water so the gold sunk to the bottom (8), but recently we have found more efficient ways to work. Gold here is found all along the beds and banks of the streams, as far as 50 feet up the bank, from the beds. We seem to find the best of luck in the clay. By having a group, we can use bigger strategies and make investments together on tools that can help us become more efficient in finding more gold. We have used a “rocker” in the past, but our new technique can work as fast as three rockers at once. Its called the tom and is 8 or 9 feet long and about a foot and a half wide. It is only a few inches high, but with the iron sieve in one end and ½ in holes, when water is hosed in and the dirt, stone, and clay is thrown in and stirred with a shovel, the water will run clear and the gold with travel through the holes in the sieve and fall into a box underneath (9). The job can get quite dirty, but with this newer method we can get through a larger amount of area per day and we found more gold than I could have imagined. Every day here is very different, although one thing is for certain, nobody ever takes breaks; and if I’m sitting down, I am the only one. Other than that you cannot predict anything, for luck is all it takes. Some nights were much harder than others, and even days went by where Henry lacked any form of big success. But recently we have been striking gold! In the first week we made about $90 and the second and third weeks we averaged about $45 and $60. In the fourth week here we had made the most yet with $150, most likely because we started grouping together and investing in these new techniques. It’s incredible how much more opportunity there can be down here. A lot of the riverbanks are becoming heavily concentrated, filled with other miners, so when we travelled north in the night to a new spot, the options were far greater. In the four months we have been here, I have noticed a decline in the amount of gold we have found, simply because of the huge boom of people that came about two months ago. There doesn’t seem to be the abundance that there was in the beginning, but still the work is constant, and we find gold almost every day, especially when you can find an untouched area. We find ourselves making about $50-$100 a week (9) which is 10 to 15 times the daily wage that is made on the East Coast, meaning that six months here would be the equivalent of 6 years at home (10)! The gold that we have found has become our currency and is used to purchase food and lodging, but it also goes towards our entertainment through alcohol, theater, prostitutes, and gambling. Once we weigh out the gold and give it to vendors and merchants, they use it to bring more to California, buying more goods. Overall, the gold rush has done so much for this area. So many people come here with hopes of turning their life around by getting rich and going back to their families, or by starting their own businesses in California. But now California is a center for hundreds of thousands of people and is in negotiation of becoming a state in a matter of weeks. Lots of agriculture, roads, schools and organizations have come about from this journey (11). There are days when I wish I had chosen this life for myself because of all of the riches, and others when I want to go home because of all of the hardships. This is the Gold Rush. 1. “State of the Union Address.” State of the Union. N.p., n.d. Web. 10 Nov. 2013. <http://stateoftheunion.onetwothree.net/texts/18481205.html>. 2. “How it Started?.” California Gold Rush. N.p., n.d. Web. 10 Nov. 2013. 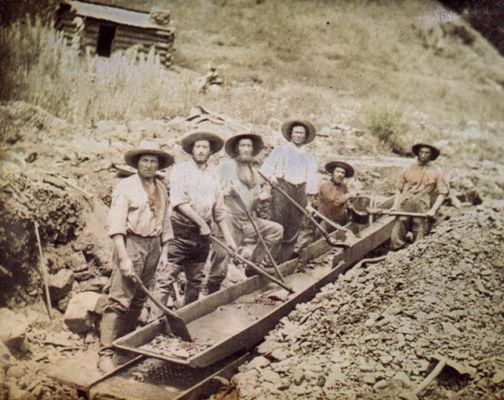 <http://www.kidport.com/reflib/usahistory/calgoldrush/HowItStarted.htm#Start>. 4. “The Overland Trail.” California Gold Rush. N.p., n.d. Web. 10 Nov. 2013. <http://www.kidport.com/reflib/usahistory/calgoldrush/OverlandTrail.htm>. 5. “California Gold Rush (1848–1858).” Open Collections Program: Immigration to the US, California Gold Rush, 1848-1858. N.p., n.d. Web. 10 Nov. 2013. <http://ocp.hul.harvard.edu/immigration/goldrush.html>. 6. “California Gold Rush.” Food Timeline FAQs: 19th century American foodways. N.p., n.d. Web. 10 Nov. 2013. <http://www.foodtimeline.org/foodpioneer.html#goldrush>. 7. “Life of a Forty-Niner.” California Gold Rush. N.p., n.d. Web. 10 Nov. 2013. <http://www.kidport.com/reflib/usahistory/calgoldrush/lifeof49er.htm>. 8. “The Mines.” Early California History: An Overview. N.p., n.d. Web. 10 Nov. 2013. <http://memory.loc.gov/ammem/cbhtml/cbmines.html>. 9. “The California Gold Rush, 1849.” EyeWitness to History. N.p., n.d. Web. 10 Nov. 2013. <http://www.eyewitnesstohistory.com/californiagoldrush.htm#>. 10. “The Gold Rush of 1849.” History.com. A&E Television Networks, n.d. Web. 10 Nov. 2013. <http://www.history.com/topics/gold-rush-of-1849>. 11. Starr, Kevin, and Richard J. Orsi. Rooted in Barbarous Soil: People, Culture, and Community in Gold Rush California. Berkeley: University of California Press, 2000. Print.